U.S. Sen. John Cornyn speaks at a conference hosted by the Texas Public Policy Foundation on Jan. 13, 2017, at the Sheraton Hotel in Austin. 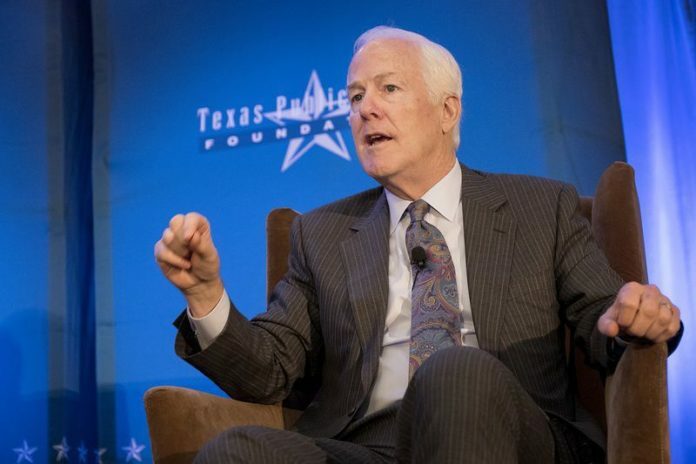 Sen. John Cornyn said Wednesday that Republicans have done their part to find a solution concerning the fate of 690,000 undocumented immigrants who came to the United States as children. Democrats must vote on legislation or offer their own, he said. Cornyn made his remarks during a conference call with reporters as lawmakers debated immigration amendments on the Senate floor. “You wonder, do people actually want a solution, or do they just like the issue they can take on the next campaign?” he said. Cornyn is a co-sponsor of the Secure and Succeed Act, which closely mirrors President Donald Trump’s call that a pathway to citizenship for certain undocumented immigrants be tied to border wall funding and tighter restrictions on legal immigration. The Trump administration announced in September that it would end the Deferred Action for Childhood Arrivals program, a Barack Obama-era policy that provides limited deportation relief and work authorization to certain undocumented immigrants. It expires March 5. Cornyn called the president’s framework a “generous offer” and said Senate Republicans are waiting for Democrats to engage. John-Michael Torres, spokesperson for La Union Del Pueblo Entero, said the organization is putting pressure on Cornyn to back less hard-line legislation.